If you’re a full time student – or aged 16-29 – you could get some of the best seats in the house at affordable prices for you and a friend. It’s free to join, giving you the opportunity to book two discounted tickets per production (this means if you’d like to bring along a friend who’s also under 30 or a full time student, they can take advantage of the scheme as well), half price programmes and email updates with all the latest news and ticket releases. To join AAA, you’ll need to create or sign in to your ENO account and register for a free AAA membership by clicking on the link below. Make sure you choose to hear from ENO by email so that we can let you know about AAA ticket releases. Once you’ve created your membership, our box office team will authorise your account and you will be able to book by 10:00 the day after you signed up. It’s that simple! 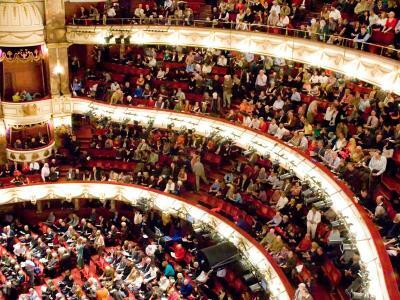 Access All Arias tickets are available to book online for all ENO productions at the London Coliseum. AAA tickets are not valid for visiting companies, including English National Ballet. You’ll need to be logged into your ENO account to see available AAA seats and book. You may be asked to show that you are aged 16-29 or a student when attending, so you should bring along proof of ID. If you’re bringing along a guest, they also need to be aged 16-29 or a full-time student in order to use an AAA ticket. You can book up to two tickets per production. There are a limited allocation of AAA tickets available per performance. Please book early to avoid disappointment. *Booking fees are £2.25 per ticket and will be shown when you select your seats. If you would like any further information on the scheme or have any queries regarding your AAA membership, please email accessallarias@eno.org. Whether you’re a newcomer to opera and in need of some advice, or arranging a special night out, here's what to expect at ENO.